For the first time ever I am going to have to destroy a plant. Not anything no longer wanted, in which case I always try to re-home wherever possible; and my allotment will be the richer for a number of plants that the garden has no space for, but the forced removal and destruction as a result of disease. I have two Cercis in the garden, one the ‘regular’ Cercis siliquastrum (Judas tree) which I’ve had for many years and it is a good strong tree. But my Cercis ‘Forest Pansy’, given to me as a birthday present a couple of years ago, has never quite taken off with the same enthusiasm and now I think I understand why. It has been in the ground for a year now, planted once the new design was completed and first I put its slow growth down to it needing to establish itself. But this year I have no such excuse to make. Some of the stems have died back altogether, and the leaves yellow and wither – they certainly don’t achieve the size of the leaves on the other Cercis, or reach the purple gloriousness they should – and if there is one thing I can be certain of this year – there is no drought to be held responsible for the wilting effects on the leaves. I looked up the plant on the RHS website and learned it is subject to verticillium wilt – and I believe this is the cause of the problem, all the symptoms match. There is nothing I can do to treat it, the guidance is to remove and destroy – and (a bit extreme this) consider grassing the area over for some 15 years! I am also prevented from replanting this species, as well as several others I might have looked to as replacements, such as Acer or Sambucus nigra because the disease is caused by a soil borne fungus. Needless to say I’ll be giving the ground a good soaking of Jeyes fluid to disinfect as best as I can. So it has to go – to leave it would be to risk the health of my English roses growing nearby, and of the other Cercis which is a size to leave a significant gap were I to have to remove it. I am now looking for plants resistant to this disease to fill the gap. 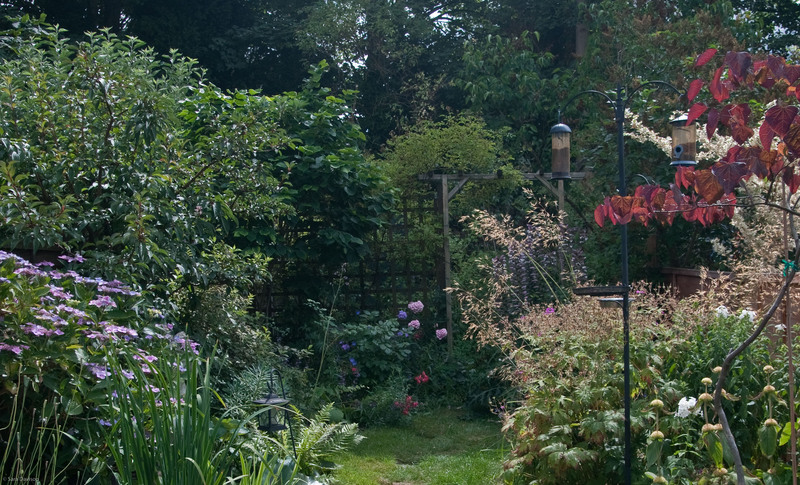 The image in this post shows the garden in 2010 with my Cercis ‘Forest Pansy’ to the right of the frame. Looking at this picture I can see just how very poorly it is now. I've been gardening as long as I can remember; initially as a child, learning from my mother, and then with each successive garden I've owned, I've expanded my knowledge and my plant collection. Starting Spring 2014 I'm taking my first steps as a flower farmer, growing British flowers for cutting on an acre of rented farmland in the Surrey Hills. This entry was posted in In my garden and tagged disease, gardening, requiem, RHS, Royal Horticultural Society. Bookmark the permalink. Thanks Flighty, it is a great shame to lose it, especially as the effect of a healthy specimen in the spot it is in would have been magnificent. It’s always a pity, but sometimes it’s the only way. Hope you find something else to fill the gap. That’s so sad… even though it’s for the greater good it must feel like an unnecessary loss. I’m sure you’ll find a great alternative! Such a shame, but at least you have identified the problem and no know the solutions. Although a disappointment it’s also an opportunity to look at what would work well in that space – time for pleasant research of the brochure and garden centre kind! Thank you, Promenade Claire, PJ Girl and ownedbyrats for your replies – and yes, the next step is to enjoy the search for a new resident for that particular space. I will update when the search is completed.